My workspace is my MacBook Air and an imaginary bubble surrounding me. As much as I’d love a home office with an antique desk, bookshelves, art, and dappled sunlight filtering through the windows, that is so not my reality. My house is too tiny for an office, and my daily obligations wouldn’t allow me to spend time there anyway. So I take my work—and my bubble—with me. I write in coffee shops, at my child’s school, the public library, the dining room table while kids light-saber duel around me. Honestly, there’s no such thing. I grab time whenever and wherever I can. That said, I usually spend an hour or two on publicity stuff—website updates, interviews, Facebook, e-mails, etc—and when that’s done, I write for a couple of hours. That’s a good day. When I’m up against a hard deadline, though, all bets are off, and the house goes to pot, because I just have to get it done. and why they are meaningful. 1. I have a sticker on my computer. 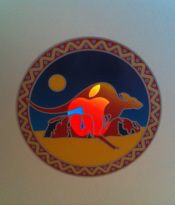 It’s a stained-glass-ish painting of a kangaroo bounding in front of Uluru (Ayer’s Rock) in Australia. My family lived down under in 2009-2010, and the country there occupies a huge part of my heart. It’s a beautiful reminder that it’s a big world, and that I want to experience as much of it as I can. 2. A postcard of art by Shepard Fairey (2005) that says ‘Make Art Not War.’ It reminds me why I do what I do—because I want to live in a world where people create more than they consume, where art and human kindness are valued over profits and violence. like it more than being loved. To me, it means that your reasons for writing, your motivation, your validation, everything has come from within. By all means, accept critique from trusted friends and editors, but the rest of it you must block out. You can’t get distracted by rejections, bad reviews, or any of the other machinations of the publishing industry. “Work is its own cure.” If that’s true for you—if you can’t not write, then you write. I make or buy a yummy drink and I clear off whatever table/couch/bench/rock where I’m sitting. I usually start with editing, so I’m not confronted immediately with the dreaded blank screen of a new chapter. Each of my novels has its own drink. This Girl is Different was iced coffee. Random [retitled The Theory of Everything] was chai. The novel I’m currently writing is unsweetened iced tea. The drink becomes part of the ritual of focusing: make the drink, clear off the table, pop in the earbuds, take a sip, start writing. It becomes Pavlovian. The white/brown noise helps. But it’s not an all-or-nothing venture; when I need a little break, I check Facebook or email, or I get up and walk around. I’m not a machine or anything. Really it just comes down to one basic question: Do you want to be an author, or don’t you? A writer is someone who writes. It’s that simple. I generally start off a novel by writing notes longhand, although I dread doing so and kick and scream all the way. Then I put it in the computer—I use Scrivener, which is the best novel-writing software known to humans—and off I go. How do you develop your story ideas? Do you use an outline, let the muse lead you, or another technique? The writer Robert Olen Butler says everything you experience goes into a compost heap—everything you think and do and see and feel gets thrown in there, and breaks down into rich, fertile soil. That’s what you grow your novels in. I’ve learned to respect the time it takes to think up a novel. A few months of busy daydreaming—repainting the house, teaching myself to reupholster furniture—that’s when stories coalesce. My house is filled with things I’ve made while "baking" my novels. This painting of trees--eucalypts on the right, blending toward north american deciduous on the left, (24 x 36” acrylic)--is a product of my busy daydreaming while "baking" a novel. When I’m ready, I start scribbling notes in my notebook. Then I take to the computer and get to page 50 or 100, and THEN I realize I probably should have made an outline. So I go back and write each scene on a sticky note and plot out a huge mind-map, which gets taped to the dining room wall for a while. The map of my current novel. 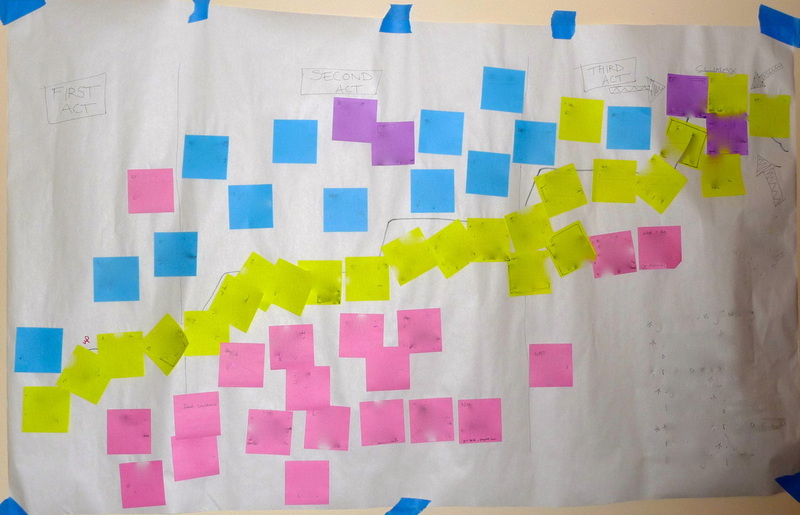 It’s approximately 3x5 feet of newsprint, and the stickies are color-coded. Chartreuse = scenes & plot points (it’s an escalating plot, you can tell by the shape of the line), Blue = "bad guys", Purple = surprises & plot twists, Pink = details to remember and character traits. Bottom right corner is a list of major themes. I’ve fuzzed the writing out because my editor would kill me if I gave away secrets! I’m constantly forced to share my workspace, and I can tell you who I LEAST like sharing it with: ice cube rattlers, cell-phone talkers, compulsive pen-clickers, and heavy sighers. Anyone else I can pretty much deal with. A fellow author once told me, “Your words are medicine for someone out there.” On bad days, that keeps me going. Find what keeps you going. And may the Force be with you. Thanks again for permission to repost, Jenn!